Dr Peter Osborne is happy to offer this technologically advanced form of rehab. Whole body vibration may be prescribed to you during your treatment plan to help improve muscle strength, tone, coordination and more. This type of treatment has also been used for weight loss and building bone mass. The therapy is so effective and beneficial that many of our patients decide to buy a machine once their treatment in our office is finished. 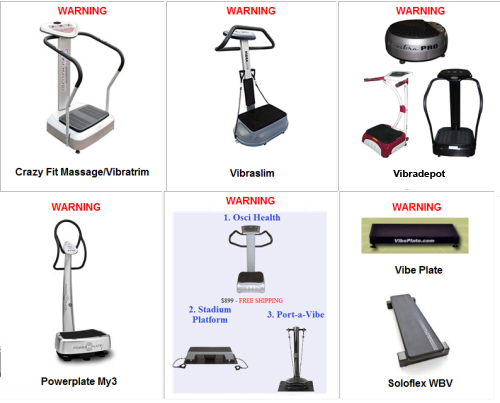 Whole body vibration has been very well researched for a number of conditions and uses. Belav, D.L. ; J.A. Hides, S.J. Wilson, W. Stanton, F.C. Dimeo, J. Rittweger, D. Felsenberg, C.A. Richardson. “Resistive simulated weightbearing exercise with whole body vibration reduces lumbar spine deconditioning in bed-rest.” Spine. 2008 Mar. 1. 33,(5): E121-31. Hazell, T.J., J.M. Jakobi, K.A. Kenno. “The effects of whole-body vibration on upper- and lower-body EMG during static and dynamic contractions.” Applied Physiology, Nutrition, and Metabolism. 2007 Dec. 32(6): 1156-63. Reichardt, Christian H. “Vibrational Therapy: How does it work for exercise?” The American Chiropractor July 2007. Kawanabe K., A. Kawashima, I. Sashimoto, T. Takeda, Y. Sato, and J. Iwamoto. “Effect of whole-body vibration exercise and muscle strengthening, balance, and walking exercises on walking ability in the elderly.” Keio Journal of Medicine. 2007 Mar. 56(1): 28-33. Rubin, Janet; Clinton Rubin, Christopher Rae Jacobs. “Molecular pathways mediating mechanical signaling in bone.” Gene. 2006 Feb 15. 367: 1-16. Bruce, Robert Douglas, III. “The Problem of Bone Loss During Space Flight and the Need for More Effective Treatments to Make a Mission to Mars Safer.” May 28, 2002. Literature Review. Raloff, Janet. “Medicinal EMFs: Harnessing Electric and Magnetic Fields for Healing and Health.” Science News, Vol. 156, No. 20, 1999, pg. 316. Griffin, M.J. “Biodynamic Response To Whole-Body Vibration.” The Shock and Vibration Digest 1981. Vol. 13; 3-12. Kalu, D.N., et al. “How Cancellous and Cortical Bones Adapt to Loading and Growth Hormone.” Journal of Musculoskeletal and Neuronal Interactions, 2000, Vol. 1, No. 1, pg. 19-23. Rubin, Clinton T. “Contraindications and Potential Dangers of the Use of Vibration as a Treatment for Osteoporosis and other Musculoskeletal Diseases.” To be published April 2007. Gilsanz, Vicente, Tishya AL Wren, Monique Sanchez, Frederick Dorey, Stefan Judex, and Clinton Rubin. “Low-Level, High-Frequency Mechanical Signals Enhance Musculoskeletal Development of Young Women With Low BMD.” Journal of Bone and Mineral Research. Vol. 21, No. 9, 2006. Rubin, Clinton, Stefan Judex, Yi-Xian Qin. “Low-level mechanical signals and their potential as a non-pharmacological intervention for osteoporosis.”Age and Ageing. 2006; 35-S2: ii32–ii36. Verschueren, S., M. Roelants, C. Delecluse, S. Swinnen, D. Vanderschueren and S. Boonen. “Effect of 6-Month Whole Body Vibration Training on Hip Density, Muscle Strength, and Postural Control in Postmenopausal Women: A Randomized Controlled Pilot Study.” Journal of Bone and Mineral Research, Vol. 19, March 2004, pg. 352-359. Barry, Patrick L. quot;Good Vibrations: A New Treatment Under Study by NASA-funded Doctors Could Reverse Bone Loss Experienced by Astronauts in Space.” Science @ NASA Web site, Nov. 2, 2001. Semler, O.; O. Fricke, K. Vezyroglou, C. Stark, A. Stabrey, E. Schoenau.“Results of a prospective pilot trial on mobility after whole body vibration in children and adolescents with osteogenesis imperfecta.” Clinical Rehabilitation. May 2008; 22(5):387-94. Melnyk M.; B. Kofler, M. Faist, M. Hodapp, A. Gollhofer. Effect of a Whole-Body Vibration Session on Knee Stability. International Journal of Sports Medicine. 2008 Apr 9. Moezy, Azar; Gholamreza Olyaei, Mohammadreza Hadian, Mohammad Razi, and Soghrat Faghihzadeh. “A Comparative Study of Whole Body Vibration Training and Conventional Training on Knee Proprioception and Postural Stability after Anterior Cruciate Ligament Reconstruction” British Journal of Sports Medicine. Online: 2008 Jan. 8. Maloney-Hinds, C., J.S. Petrofsky, and G. Zimmerman. “The effect of 30 Hz vs. 50 Hz passive vibration and duration of vibration on skin blood flow in the arm.” Medical Science Monitor. 2008 Mar. 14(3):CR112-116. Tihanyi, T.K., M. Horváth, G. Fazekas, T. Hortobágyi and J. Tihanyi. “One session of whole body vibration increases voluntary muscle strength transiently in patients with stroke.” Clinical Rehabilitation 2007. Vol. 21: 782–793. Price, Kelly. Article in the Nashville Medical News. “MS and WBV: A Promising Combination.” October 2006. Schuhfried, Othmar, C. Mittermaier, T. Jovanovic, K. Pieber and T. Paternostro-Sluga. 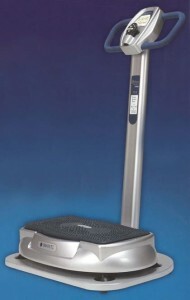 “Effects of whole-body vibration in patients with multiple sclerosis: a pilot study.” Clinical Rehabilitation 2005. Vol. 19: 834-842. Fontana, Tania L., Carolyn A. Richardson, and Warren R. Stanton. “The effect of weightbearing exercise with low frequency, whole body vibration on lumbosacral proprioception: A pilot study on normal subjects.”Australian Journal of Physiotherapy. 2005: Vol. 51.
van Nes, Ilse J.W., et al. “Short-Term Effects of Whole-Body Vibration on Postural Control in Unilateral Chronic Stroke Patients: Preliminary Evidence.” Abstract from the American Journal of Physical Medicine and Rehabilitation, Vol. 83, No. 11, Nov. 2004, pg. 867-873. Lenhardt, M.L., et al. “Use of High-Frequency and Muscle Vibration in the Treatment of Tinnitus.” International Tinnitus Journal, 2003, Vol. 9, No. 1, pg. 32-36. Bosco, C., et al. “Hormonal Responses to Whole-Body Vibration in Men.”European Journal of Applied Physiology, 2000, pg. 449-454. Bruyere, O., et al. “Controlled Whole Body Vibrations Improve Health Related Quality of Life in Elderly Patients.” Research article abstract. Haas, Christian T., Stephan Turbanski, Kirn Kessler and Dietmar Schmidtbleicher. “The effects of random whole-body-vibration on motor symptoms in Parkinson’s disease.” NeuroRehabilitation 21, 2006: 29–36. Turbanski S, Haas CT, Schmidtbleicher D, Friedrich A, Duisberg P.“Effects of random whole-body vibration on postural control in Parkinson’s disease.” Research in Sports Medicine, 2005, Jul – Sep, Vol. 13, No. 3, pg. 243-56. Annino G., E. Padua, C. Castagna, V.D. Salvo, S. Minichella, O. Tsarpela, V. Manzi, S. D’Ottavio. “Effect of whole body vibration training on lower limb performance in selected high-level ballet students.” The Journal of Strength and Conditioning Research 2007 Nov. 21(4):1072-6. Study sponsored by National Institute on Aging (NIA). “”VIBES” – Low Magnitude Mechanical Stimulation to Improve Bone Mineral Density.”Study to run from Feb. 2007 through Sept. 2010. Study sponsored by University Health Network, Toronto. “Influence of Vibration on Bone Mineral Density in Women Who Have Weak Bones After Menopause”. Study began Nov. 2006. Study sponsored by the University of Erlangen-Nürnberg. “Effect of Whole Body Vibration on Bone and Fall Related Parameters.” Study to run from July 2006 to Oct. 2007. Study sponsored by the National Institute of Arthritis and Musculoskeletal and Skin Diseases. “Vibration Intervention to Improve Bone and Muscle in Children with Cerebral Palsy.” Study to run from Sept. 2004 through Sept. 2007. Study sponsored by the Logan College of Chiropractic. Whole Body Vibration Therapy in a Participant With Multiple Sclerosis Related Balance Deficits – A Case Study. Study to run from June 2006 through Feb. 2007. Study sponsored by Oregon State University College of Health and Human Sciences. “OSU Researchers to Shake-Up Hip Replacement Therapy.” by Stephen Swanson, 2006. Dembner, Alice. “New buzz on an old workout fad.” July 8, 2006: The Boston Globe. Rainer, Michelle. “Shake your booty: can a vibrating machine jiggle you into shape? Devotees of Whole Body Vibration say yes.” September 1, 2007: Fairchild Publications, Inc.
Gallagher, Noel K. “Maine scientist finds vibration slims abdomen; His mouse study suggests exercise may move fat to where it benefits the body.” October 23, 2007: Portland Press Herald (Maine). Oleck, Cecilia. “Whole lotta shakin’ goin’ on: Body vibration therapy is helping people with spinal cord injuries build bone density and muscle tone.” October 3, 2006: Detroit Free Press.